Under pressure Harriers manager, Gary Whild, will have his work cut out inspiring the team to a positive win at home to Torquay Utd tomorrow. The newly relegated club are in the same position as us having crashed out of the FA Cup last Saturday and also not being in the best of form as of late. Their 2-0 defeat at Aldershot was their fifth defeat in six games (ours isn't so bad with only three defeats) and it was pretty well expected with them away at a side with better form whereas we lost at home to Eastleigh and looked as if we were a team from three divisions lower. We were shocking to say the least. Again we were totally devoid of any real idea as to what we were supposed to be there for and what we were supposed to be doing. This time last season we were just about to start on our FA Cup journey and the fans were drooling over the skills of Joe Lolley, Chey Dunkley and Danny Jackman to name just three. Lolley and Jackman have both gone, one higher and the other lower, while Dunkley is a mere shadow of what we came to expect last season. He is now now longer a solid rock in defence, is slow to make decisions, his passing is terrible and the sad thing is it no longer seems his choice but that of someone else. Chey is not alone in this respect and none of the team seem to be enjoying themselves any more. How do they think we, the fans, feel? Hopefully that awful defeat last Saturday IS the kick up the combined jacksies that they all deserve. Not one of them has inspired this season so far and to that end Whild has sent striker Reece Styche out on a month long loan to Conference North side Tamworth. We should have Jack Byrne back from suspension tomorrow but could still be without Josh Gowling with a shoulder injury. Torquay will be without winger Jordan Chapell after he broke a bone in his hand at Aldershot but they will have their Captain, Luke Young, back from a one match suspension. 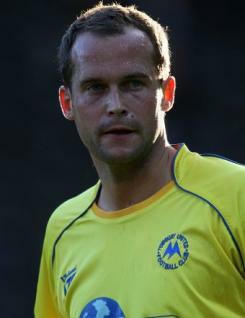 We last met up with Torquay in their promotion season of 08-09 and completed the double over them, both times by the single goal. They went on to gain promotion via a play-off win over Cambridge Utd and two seasons later reached the play-offs for that league but lost in the final to Stevenage. The following season they finished in the play-offs again but didn't progress further than the first stage. They then struggled and finally got relegated last season despite winning the final game only for the other two teams down there, Bristol Rovers and Northampton to win both their games although that failed to save Rovers too. The Harriers defender Kevin Nicholson (left) is a former Gull and spent seven seasons with them racking up over three hundred games. He fell out of favour towards the end of last season and decided his future lay elsewhere, namely Kidderminster. The left back is supposed to have signed a contract with us following his playing on a non-contract basis since August but this has yet to be confirmed by the club even though the Torquay press already have. STOP THE FRONT PAGE: The Harriers signed Matt Robinson on a month long loan from Luton Town after the publication of this article. Lewis, Singh, Hodgkiss, Green, Storer, Dunkley, Nicholson, Gowling, Grimes, Robinson, O'Keefe, Byrne, Obeng, Johnson, Verma, Blissett, Gittings, Gash, Reid. Rice, Seabright, Tonge, Cruise, Downes, Pearce, Harding, Briscoe, Young, Bowman, Ajala, Cameron, Yeoman, Thompson, Richards, Benyon, Parcell, Chaney, Hutchings, MacDonald, Wakefield, Ofori-Acheampong, Ives.